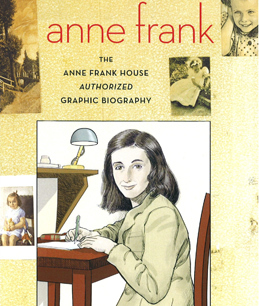 The topic of the 2011 Association of Jewish Libraries conference (think I got the name wrong on a previous post) this past weekend was Graphic Literature. I’m still buzzing with excitement about the conference, so I’ll share some highlights. The wonderful presenters included Sid Jacobson (author of the recent and much-lauded official graphic biography of Anne Frank), William Rubin (co-creator of Homeland: the Illustrated History of the State of Israel), and Barry Deutsch, who just won the Sydney Taylor Award for Hereville. Each one described their recent work, its development, public reaction, and future projects. Mssrs. Jacobson, Rubin, and Deutsch were all charming and engaging and totally worth seeing (and buying their books!). BUT the most amazing speaker of the conference was Anastasia Betts. Mrs. Betts is currently a consultant and curriculum developer. She presented research on literacy and graphic literature (including comics, graphic novels, manga, etc.). The highest literacy rates in the world are in Finland and Japan (99%). They are also the biggest consumers of graphic literature. Graphic literature is more than just comics, but can come in every genre, for any audience. The text, particularly unfamiliar vocabulary and main ideas, are supported by pictures for weaker readers. Visual learners have more cues than in traditional text. Eyes move differently over the pages. If you introduce graphic literature into a school library, use of the library by students will increase by more than 80 percent, with 32 percent of the increase in borrowing being the non-graphic literature! We’ve already seen graphic formats being adopted by Jewish publishers (see authors above). You can even argue that he fabulous Katz Hagaddah with illustrations by Gadi Pollock that many of us use on Pesach is an example of this phenomenon. Think of how readers react to it, or to the graphic 39 Melachos of Shabbos book, or to Trekking Through Time, or The Search for Stones (illustrated by the wonderful L.A.-local Marc Lumer). I’ve seen kids and even adults ooh and ahh over them. I’m hoping that this will be a trend that continues.